Not quite a 5, 4.5. Every episode which features Bad To The Bone is a 4 at least. "...how long it would take them to get Connie Chung pregnant." 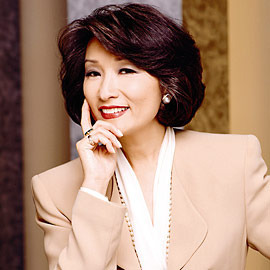 Connie Chung is hot. Anyone else agree? She doesn't do much for me. Does anyone (Dr. Shoe?) know the exact reason for the "pregnant" line? Was it because around that time (1990/91) Chung and Maury Povich were trying to get pregnant and she was, like, 40? marriedaniac wrote: She doesn't do much for me. Oh, I didn't even know about that. But that reasoning sounds pretty good! That's also very wierd...I'm going to have to look that up now. She hasn't been around for awhile now, I wonder if she finally had a kid. One thing I've noticed about this show it that sometimes the jokes reference things before our time. Its good to watch with an older person and then I'll just turn and ask "Do you know what that's about?" Good luck on your Chung research. Have no idea if she finally did have a kid (or maybe several?) but I think she and Povich divorced a few years ago. Dr. Shoe wrote: One thing I've noticed about this show it that sometimes the jokes reference things before our time. Its good to watch with an older person and then I'll just turn and ask "Do you know what that's about?" I wonder what kind of royalties Mel Gibson gets for a shower nozzle. I give you Al and Peg's wedding song as mentioned in the episode. I kinda like it. In fact, after I found it I kept playing it over and over. WARNING! It's very sappy. A special thank you to Marriedaniac for helping me figure how to post this video. I had a hell of a time with it. I do love a lot of their songs, and Karen Carpenter's voice. "We've Only Just Begun" is a guilty pleasure. No probs, Dr Shoe! Just glad it worked.